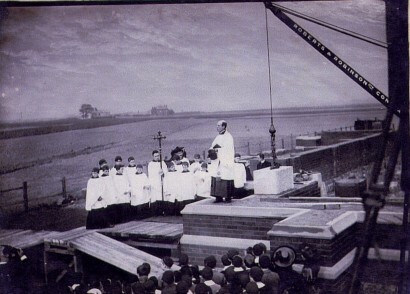 The foundation stone of Saint Faith's Church, Great Crosby, was laid on May 24th, 1898. Thanks to the archive of the `Crosby Herald' in Crosby Library, a full account of the event, dated May 28th, 1898 has survived and is printed in full below, with the original spelling and punctuation. It gives fairly exhaustive details of what took place. The prose is somewhat turgid, and the tone deferential, but it seems a solid piece of history. The factual style of the reporting mostly conceals the controversial nature of the building, although the content of the final hymn, and the veiled reference to divergence in the address, give some clue. For the story of how the site was acquired, return to the Horsfall home page and access'The Founding of Saint Faith's: the Myers Connection'. Some further information about the lifeand death of Robert Elcum Horsfall will be online soon. Douglas Horsfall's younger son, Ewart Douglas, who is described below depositing the 'time capsule' turns up later in history as a distinguished oarsman. At the Stockholm Olympic Games of 1912, he is recorded as winning an Olympic Rowing Gold Medal. 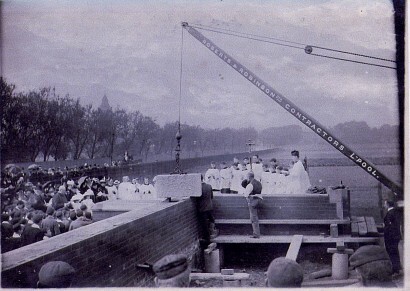 'The laying of the foundation stone of S. Faith's Church, tobe erected on a site in the Waterloo Parochial District and in the Crosby Ecclesiastical District, opposite College Road, took place on Tuesday afternoon, and was characterised by grace and beauty. The afternoon was beautifully fine, and the ceremony was witnessed by a large crowd congregated both within and without the barrier. Mr. Douglas Horsfall, by whose generosityand liberality the edifice will be erected, desired the function to pass off as quietly and simply as was consistent with the occasion. He issuedno invitations to the laity, and only the clergymen of the immediate neighbourhoodand those of the churches with whom Mr. Horsfall is connected were present. The clergy in attendance were the Rev. C.C. Elcum, vicarof St Agnes Church, Liverpool; the Rev. Canon Leigh, Walton; the Rev. C.de B. Winslow, vicar of St Nicholas Church, Blundellsands; the Rev. R.G.B.Smethwick, vicar of St Thomas's Church; the Rev. F.F. Grensted (of MerchantTaylors' School. Ed. ); The Rev. W.A. Reeves; the Rev. A.J.Morris; theRev. M.F. Bell, vicar of St Catherine's Church, Liverpool; The Rev J.G.Love; the Rev. M. Longridge, the Rev. D.G.F. Smith, vicar of St Paul's Church, Liverpool; and the Rev. Canon Armour, of the Merchant Taylor's (sic)School, Crosby. A number of the pupils of the school accompanied Canon Armour and took part in the service. The ceremony was opened by the singing of the favourite hymn, 'The Church's One Foundation'. The choir of St Agnes Church, Liverpool, were in attendanceand led the praise. The Rev. C.C. Elcum, who officiated, offered a prayer, and after the singing of the 127th Psalm, Mr Horsfall conducted his sons,Masters Robert Elcum (7) and Ewart Douglas (6), to the platform that hadbeen erected. While the stone was suspended over the spot where it wasto be laid, Master Robert said, 'We lay this stone in the faith of Jesus Christ, and in the name of the Father, and of the Son, and of the HolyGhost. Amen'. Master Ewart then placed a glass bottle of a light blue hue, containing a copy of the service in connection with that ceremony, the coins of the realm, and the Liverpool newspapers of the day, in the cavity, and amidst a solemn silence, broken only by the sound of the silver trowelpassing over the mortar, the stone was lowered to the place which it willhenceforth occupy in the building. Master Robert then gave three taps on the stone with the handle of the trowel, and said, 'I declare this stonet o be well and truly laid, in the name of the Father, and of the Son, andof the Holy Ghost'. The inscription on the stone was, 'This stone was laidby Robert Elcum Horsfall, 24 May 1898'. Inscribed on the trowel, whichwas of beautifully chased silver with ivory handle, was, 'Presented to Robert Elcum Horsfall on the occasion of the laying of the foundation stone of the Church of S. Faith, Crosby, near Liverpool, 24th May 1898'. The hymn, 'O Lord of Hosts' was rendered, after which the Rev. Mr. Elcum said he thought the very eloquent service which had just been witnessed spoke for itself. He might ask why were they there? The first answer would be that everyone directly or indirectly had come to the greater glory of Almighty God. In every work, especially in religious work, the glory ofGod should come first. But they could not ignore the human. They also came to show their honest and hearty sympathy with the Christian principleswhich underlay the Christian liberality which was building that church.They were there because they wished to show by their presence that they recognised the nobility of dedicating a work like that to the honour andglory of God. They could not help diverging a little in one direction or the other, but surely in the unity of the church, in the unity of the faith,and in the unity of God, who was one though three, there must be limits to their divergence. They themselves were part of the great cornerstone, and the two portions of the corner stone fitted one into the other. He trusted that at last they may all lay the top stone of their own spiritualedification, and not in this world, but in another and better, where therewould be no foundation stone, only the one great temple, for God himselfwas the temple. The rendering of the hymn, 'Faith of our fathers' (reportedly DouglasHorsfall's favourite hymn. Ed) and the pronouncing of the Benediction concluded the ceremony. Canon Armour and Mrs Armour afterwards hospitably entertained at the school the clergy, the choir, and several other ladies and gentlemen, including Mr. and Mrs. Horsfall. The work thus so impressively and beautifully inaugurated marks the commencement of a building which should enhance the architectural features of a well-appointed district generally and immediate neighbourhood specially. Most residents in the district will be familiar with the location of the site. It is almost opposite the Crosby-road end of College-road. A more commanding site could scarcely have been selected in the district, andMr Horsfall has been assured that it is also the most suitable. Before taking any steps Mr Horsfall consulted the Bishop of Liverpool (BishopRyle. Ed.) as to the district in which he considered a church should be erected. The Bishop said there was a church needed between Waterlooand Crosby, and Mr F. Myers (Mr Horsfall's cousin) having generously offered the site on which the building will stand, Mr Horsfall decided to build there. The land covers an acre. The building will be constructed to accommodate 800 persons. It will be of brick, faced with Accrington brick, with red Runcorn stone dressings. The floors will be covered by wood blocks. Theroof, on the hammer beam principle, will be 52 feet to the top of the ridge and 32 feet to the wall plate, and will be covered by green Westmorelandslates. The west end of the church will face Crosby-road North. The navewill be 109 feet long and 39 feet wide, with narrow aisles 74 feet in length.The transepts will be 22 feet square, and the chancel 42 feet in length. The church fittings and endowments will cost Mr Horsfall £20,000. Mr Horsfall's efforts are not confined to the erection of this church. It was he who built St Agnes' Church, Liverpool, in memory of his father,Mr Robert Horsfall: also St Pancras' Mission Church, Liverpool. He is moreover patron of St Paul's Church, St Paul's-Square, and St Catherine's Church,Abercromby-Square, both in Liverpool. Top of page: workmen standing by before the stone is lowered. Mr Elcum,with controversial biretta above and his choir to his left, surveys the crowds. Bystanders line Liverpool Road; behind them the tower of Merchant Taylors' School, built some ten years previously, may be seen above thetrees lining the road. Open fields behind the crane lead to the trees surrounding Crosby House, the earlier residence of the Myers family, from whom theland on which the church stands passed to Douglas Horsfall. Lower: Mr Elcum, biretta now in hand, presumably delivering hisaddress. The stone is ready to be lowered into its final position, but there is no sign of the Horsfall boys nor of the blue bottle. This viewis looking 'inland' from the previous one, across the wide open spacestowards what is now the Endbutt Lane area and covered with streets and houses. Just two large, so far unidentified buildings (too far east to be Crosby House) and a tree or two stand in the background.